It must tell us something about these post-everything times that nowadays everything we buy has to be described as “authentic”. Nowhere more so than in our restaurants. The words “real” and “proper” are plastered all over menus in the hope of convincing us that we’re getting – what? Something that isn’t fake? 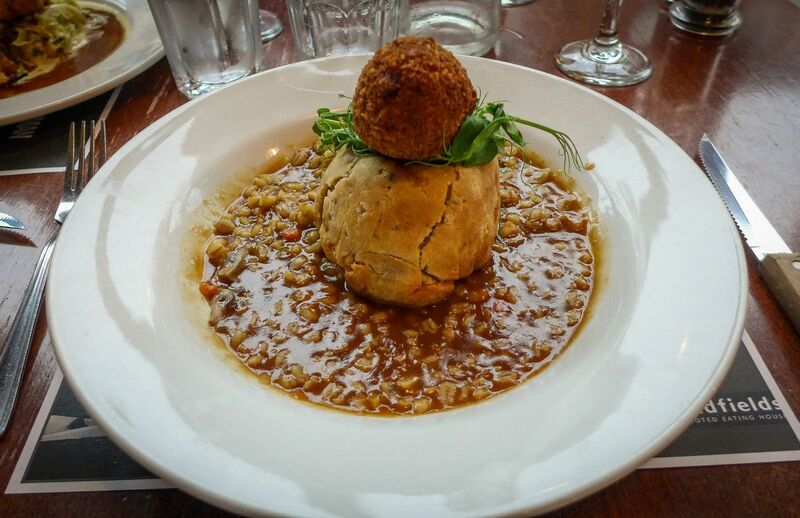 “We’re proper cooks, serving real British food, cooked properly”: that’s the claim from Oldfields, or “Oldfields Noted Eating House” as it likes to be called. I wonder: what does “unreal food” taste like? Do other restaurants have pretend chefs, rather than proper ones? 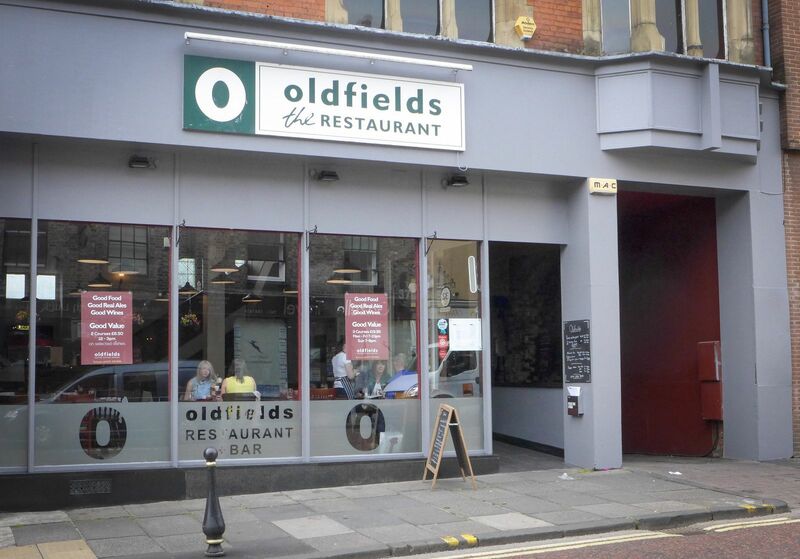 So is Oldfields the UKIP of the North East restaurant industry, offering to take us back to a golden age of British cookery, untarnished by nasty foreign influences? Or is this simply an attempt to celebrate local produce? The restaurant, a Durham stalwart for many years, certainly talks a lot about real British food on its website. It has a loyalty card called “Real Food Club” and its paper placemats feature moody black and white pictures of real suppliers from whom they get proper raw materials. Regardless of the quality of the ingredients, it still takes a decent technique to prepare them properly. Sadly, we could detect very little technique here. 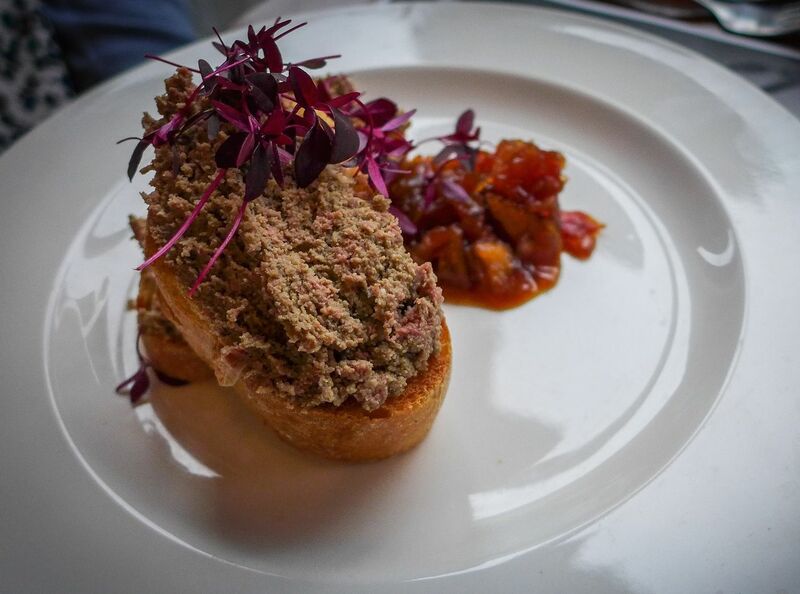 A starter of whipped chicken livers with toast and chutney appeared as a grainy liver pâté that would have benefitted from a sieve or two and perhaps a good dose of dairy. The toast on which it sat was thick slices of average baguette (or whatever the English word is for baguette). They have a new proper chef called Jonny Laight, who’s brought in a new June menu. 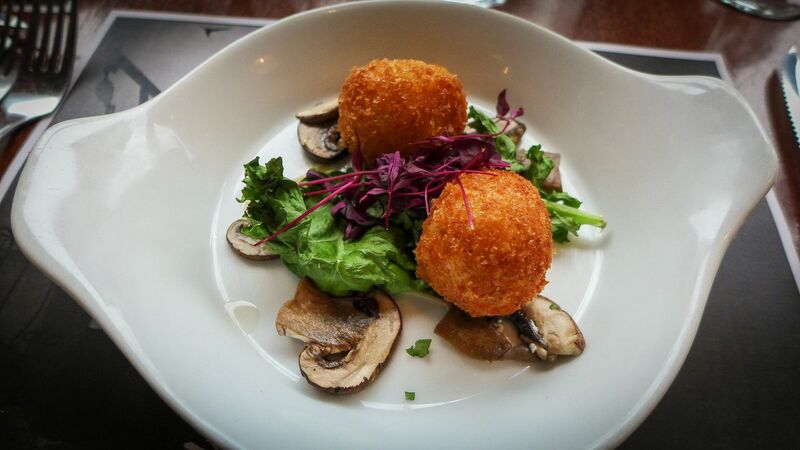 I ordered his pickled mushrooms, paired with goat’s cheese croquettes and crispy kale, but was rewarded with a few wan slices of raw button mushroom, fresh out of a dull vinegary bath. The idea of something acidic to cut cheese is a fine one, but simple cornichons or pickled beetroot would have worked far better. The kale underneath was dried out rather than crispy, and few things annoy me more than gratuitous micro-herb garnishes. The croquettes themselves were fine but few, of which more later. Both of our main courses were whacking plates of un-summery stodge. That’s actually fine, because we had foolishly chosen winter dishes from the new June menu. What was less fine was that Mrs Diner’s lump of pork shoulder, a cut known for its good fat content and consequent succulence, was bone dry. My suet pudding, filled with rabbit and black pudding, was enjoyable, for the blood sausage had kept the bunny moist. Unfortunately, the pearl barley ‘jus’ turned out to be a loose and lacklustre grain risotto, a gravy you’d have needed a serious salt deficiency not to find unpleasantly overseasoned. The best-looking dish of the night belonged to the friend who’d joined us for dinner. 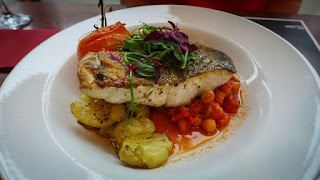 I was quite envious of her handsome tranche of cod, served with crushed potatoes and vine tomatoes. It was the evening’s only real success. Mrs Diner and I both went to South America for our wines – a rich, full Malbec for her, a fragrant but slightly flat Chilean Pinot Noir for me. The list is limited to six reasonably priced reds and whites, curiously divided by quality, rather than grape or provenance, using descriptions like Good, Better, Smashing, or Best. I guess this smacks of honesty, but it does suggest the restaurant assumes its customers know nothing about wine, and are merely capable of selecting either red or white and letting their wallets do the rest. Puddings were also simplistic. My rum baba had a decent thwack of booze in the sponge, although confusion reigned when I asked what rum they soaked it in. 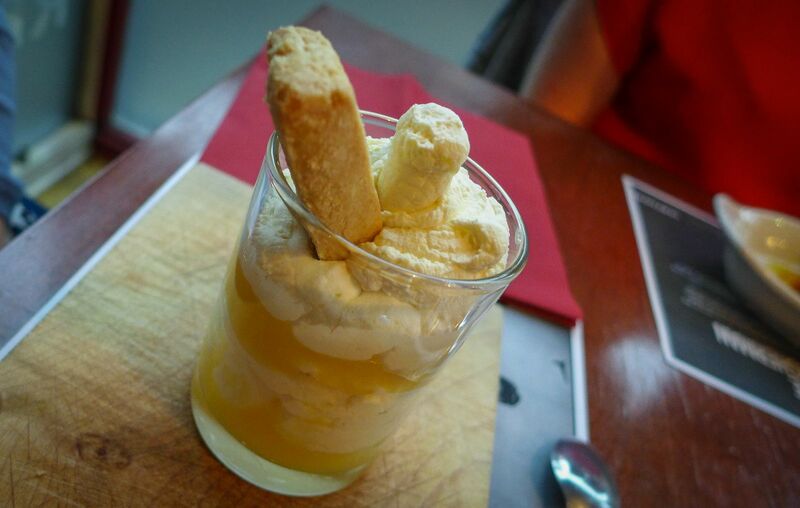 Halfway through her lemon syllabub, Mrs Diner grimaced and said: “This tastes like it’s been hanging around for a while”. That’s a pretty good summation of much of our meal. Nevertheless, service was cheery and efficient and we had a nice table in the window from where we watched Durham strutting its stuff on a Saturday night. 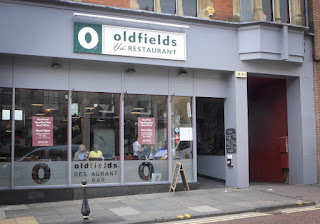 Oldfields is a conventional bistro in ambience, with tables set quite close together. Unfortunately, in the evening at least, they’re not serving up conventional bistro prices. We’d arrived at bang on 6pm. The early evening bargain menu (3 courses for £20) is served until 6pm. I asked if we could look at it, but was told we were too late. Fair enough. But what was less fair was that the two canapé-sized deep-fried nuggets of cheese that comprised my starter cost me £6.50. In any bistro this would be miserly, but in the North East we call that a ripoff. 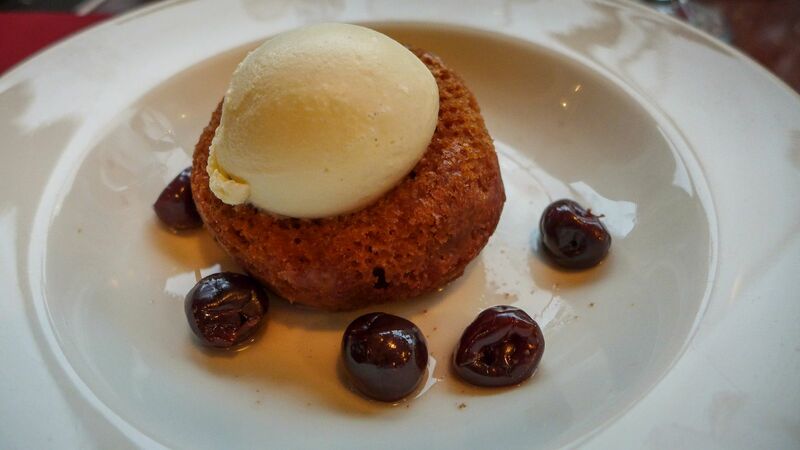 Mains are all £17.50 and puddings £5, which puts three courses for one person at £29. As I polished off my wine and got ready to leave I thought of all the restaurants in our region that do a better job for the price. It’s a long list, and every one of them serves real and proper food too. 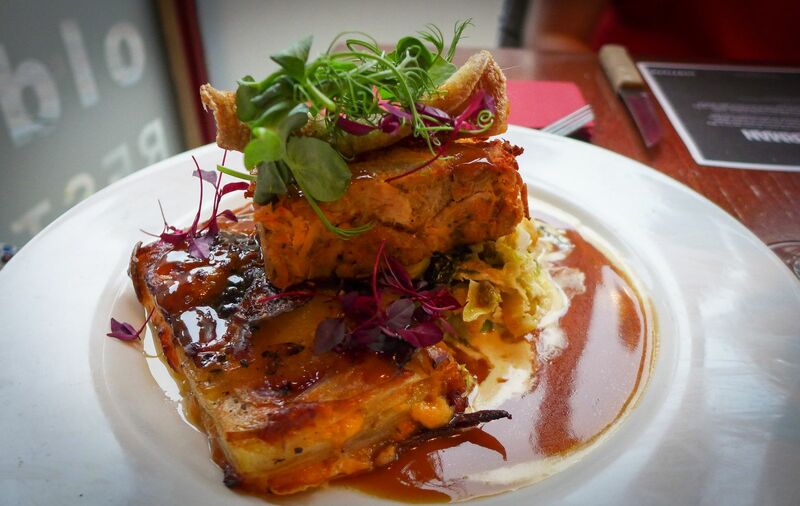 Durham itself has a couple of excellent places to eat for not much more than Oldfields. DH1 and Bistro 21 both have 5 stars, and I urge you to seek them out. I’d loved to have added Oldfields to that list, for it clearly has a local following, but it really came nowhere close. Halfway through our meal, I actually began to crave a flashy sauce, a bit of messing around, a touch of imagination from the chefs. For let’s face it, the best food isn’t real, it’s unreal, extraordinary, special. But that requires some proper cooking.